I am deeply saddened to hear of the death of Bill Frindall, the greatest voice of cricket as far as I'm concerned. 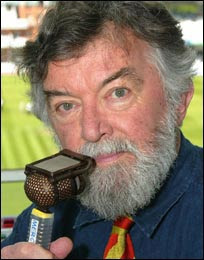 I know absolutely nothing about the game, its rules or players but I do know that I will greatly miss that wonderful awfully posh voice on my radio when Test Match Special comes around again. I actually didn't know anything about the man except that he seemed to have a vast knowledge of his beloved cricket. It was a real treat listening to him giving the scores and above all when he and his co-commentator just chatted away like two elderly gentlemen in straw hats sitting in a field of buttercups on a summer's evening. I will miss that voice. My prayers are with his family and friends, may he rest in peace.